The developers of the new lattice light sheet microscope have teamed with cell and molecular biologists to produce stunning videos of biological processes across a range of sizes and time scales, from the movements of individual proteins to the development of entire animal embryos. The scientists, including postdoctoral researchers Bi-Chang Chen (now at the Research Center for Applied Sciences in Taiwan), Wesley Legant, and Kai Wang, described their new technology and its applications in the October 24, 2014, issue of the journal Science. "What happens is you end up designing the questions you ask around the tools that are available," Legant says. With the lattice light sheet, the Betzig team can now optimize their imaging technology for the questions that biologists want to answer. Betzig's team had to incorporate a few tricks into that microscope to address a problem that arose from the shape of the Bessel beam. "It's not just a thin pencil of light – it has these dimmer side lobes," Betzig explains. "So when you sweep that across a sample, you get out-of-focus light." One solution was to shift the beam step-by-step across the sample, illuminating it with a grating pattern. The researchers could then computationally strip out the blurriness caused by the Bessel beam's side lobes – a technique known as structured illumination. Structured illumination can also be used to overcome light microscopes' usual limits of spatial resolution. To apply a super-resolution structured illumination technique developed at Janelia by the late Mats Gustafsson, Betzig's team moved the Bessel beam to produce a lattice-like pattern of light. "With that we not only get rid of the side lobe stuff, we actually push the resolution a bit beyond the diffraction limit," he says. To reduce the time required to move the Bessel beam each time a sample was imaged, the developers split the beam into seven parallel parts, so each traveled just one-seventh of the original distance. Suddenly, the cells they were imaging seemed healthier. "What was shocking to us was that by spreading the energy out across seven beams instead of one, the phototoxicity went way down," Betzig says. "What I learned from that experience is that while the total dose of light you put on the cell is important, what's far more important is the instantaneous power that you put on the cell." Could they reduce light toxicity even more by dividing the Bessel beam? Betzig wasn't sure what would happen when the beams began to crowd one another, so he modeled the potential effects. Although the beams interfered with one another, the model proposed certain arrangements where that interference actually destroyed the undesirable lobes of light. If he could reproduce those "magic periods" with actual light, the imaging potential was huge. "What you get is sort of a triple win," he says. "You spread the energy out, this highly structured plane is ideal for doing structured illumination with high contrast, and you get rid of that nasty side lobe problem." That's when Betzig dusted off an idea he'd had more than 10 years ago. Working theoretically, he'd proposed a technique he called optical lattice microscopy, which would limit damage to cells by illuminating a sample with a massive three-dimensional array of light foci. Other technologies had taken hold when Betzig moved to Janelia in 2005, and he'd never built an optical lattice microscope. But the idea remained sound. "We used the lattice theory to predict the patterns that would produce these magic periods," Betzig says. Moving from theory to actual patterns of light proved challenging. Chen and Wang tackled the problem, and eventually devised a way to create the optical lattice by modulating light directly on the imaging plane. 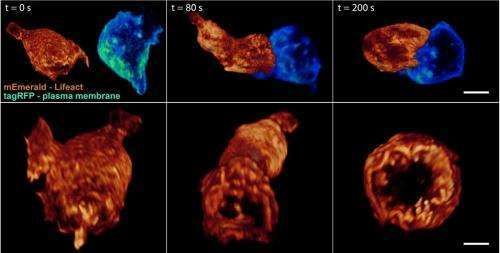 After months of struggle, Chen says, they were able to produce three-dimensional images of cells with the detail, speed, and low toxicity that they'd hoped for. "When we saw the first experimental data, we knew everything was working fine," Chen says. The new microscope operates in two modes. One uses the principles of structured illumination to create very high-resolution images. In this case, the final image is created by collecting and processing multiple images of every plane of the sample. Imaging can be sped up to capture faster processes, albeit at lower resolution, with an alternative "dithered" mode. Light exposure, and thus damage to cells, is lower in the dithered mode; in many cases, tagged proteins are naturally replaced by cells before their signal fades appreciably. 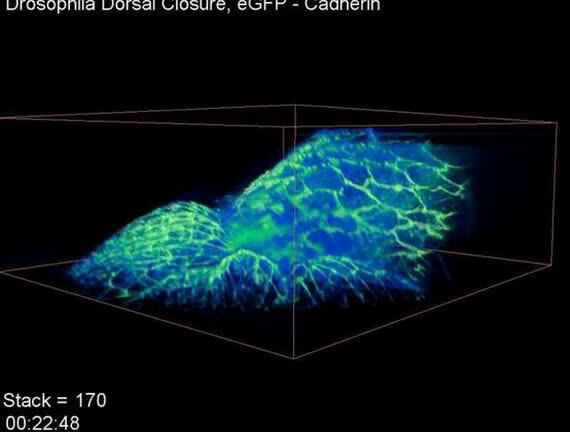 "So there are many cells you could look at forever in 3D," Betzig says. Thirty teams of biologists have come to Janelia over the past year to find out what the lattice light sheet microscope can reveal about the systems they study. Chen, Legant, and Wang have worked with the researchers to optimize the technology for a variety of experiments. "This is not a single imaging technique," Wang says. "It's an imaging platform." The microscope's high resolution means it can track the movements of individual proteins in three dimensions, and Betzig says these applications are among the most exciting. "Normally when people do single-molecule studies, they have to do them in thin, flat cells, because the out-of-focus light kills you if it's thick." The lattice's ultra-thin light sheet eliminates that problem, and permits single molecules to be seen even in large multicellular specimens. 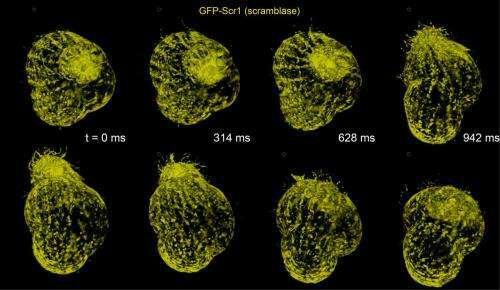 The microscope is also fast enough to track the rapid growth and retraction of cytoskeletal components in dividing cells, and gentle enough to monitor the molecular dynamics of developmental processes that unfold over many hours. The Science paper includes videos of these and other processes gleaned from the Betzig team's collaborations, but the scientists say they represent only the beginning. "We know what the microscope can offer in terms of the imaging, but I think there are a lot of applications we haven't even thought of yet," Legant says. Harvard cell biologist Tomas Kirchhausen first used Betzig's lattice light sheet microscope during a visit to Janelia last year, and knew immediately he wanted to add one to his own lab. 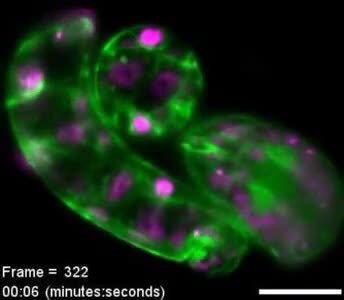 After working with Betzig's team to purchase the parts, assemble a "clone" of the original microscope, and set it up at Harvard, Kirchhausen says his team is now generating amazing movies of a variety of dynamic processes in living cells. They are using the technology to track the assembly of thousands of vesicles, watch viruses enter cells, and study how cells change size as they divide. The new microscope has enabled his team to track these processes in a more complete context, since they can now visualize individual molecules within a three-dimensional space, instead of seeing just one plane of a cell at a time, Kirchhausen says. In fact, Betzig's team freely shares its designs, providing detailed instructions to scientists with the expertise to build their own version of the instrument. Zeiss has licensed the Bessel beam and lattice light sheet microscopy. "It takes a huge amount of effort to move from a successful high-tech prototype to broader adoption of an imaging technology," Betzig says. "Ultimately, commercialization is the crucial last step to ensuring that these technologies can have broad impact in the research community." Scientists who wish to use the lattice light sheet microscope for their own research can submit a proposal to Janelia's Advanced Imaging Center at http://www.janelia.org/aic. How does Stanford's Nobel winner illuminate dark cells, revealing life and death?